from left to right: Valerie Chow, Zhao Wen-Zhou and Austin Wai in The Blade. 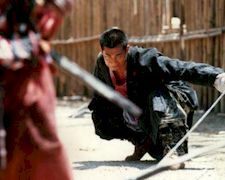 The Skinny: Dizzyingly staged, ultra-violent deconstruction of the wuxia pian genre that is questionably successful as an art film, but undeniably compelling as a martial arts tale. Tsui Hark scores. Tsui Hark’s violent retelling of the One-Armed Swordsman comes off as a revisionist spaghetti western set in Ancient China. Zhao Wen-Zhou stars as On, a tormented orphan who has worked at a blade manufacturer since his father died years ago. When he discovers that his father died saving his master from certain death at the hands of Fei Lung (Xiong Xin-Xin), he leaves with intent to gain revenge. Ling (Sang Ni), his master’s daughter, has a decidedly stranger affliction. She imagines the world of Gong Wu to be her own private playground of men who fight over her. On is one of her targets, and he bears a scar she gave him when they were young. When On leaves, she runs after him and is caught by some bandits plaguing the countryside. On saves her but loses his arm in the process, becoming “useless” and unable to seek the revenge he must. He falls into a chasm, lost to his former life. While On recuperates far away, his rival Iron Head (Moses Chan Ho) and Ling set out in search for On, but instead of getting any real results they find themselves immersed deeper in Ling's Gong Wu. Iron Head "saves" a comely prostitute (Valerie Chow) and then uses her for his own pleasure, which horrifies Ling. Meanwhile, On is persecuted by those around him as a cripple. Fed up, he takes his father's broken blade and trains himself in a dizzying martial arts style utilizing speed and athleticism to compensate for his lost limb. The concept of Gong Wu is used by Tsui Hark for purposes of deconstruction. Gong Wu (AKA: Jiang Hu), loosely translates to the “World of Martial Arts,’ and is referred to as “Emprise’s Field” in The Blade's subtitles. Hark uses rampart voiceover from Ling to deconstruct the basic themes and creeds at the heart of Gong Wu. Ling is an isolated young woman who descends into near-madness as she cannot comprehend the futility and desolation at the heart of their world, where honor and heroism are sought through violence, lust, and hatred. In Tsui Hark's new vision, there is no heroism, just revenge begetting revenge in a never-ending cycle. Conversely, On’s story is more traditional of the genre, as he triumphs over his inabilities by honoring his father and challenging evil. His redemption involves seeking revenge out of justice, and not hatred. On ultimately becomes a force for good, a direct juxtaposition to the darkness that Iron Head and Ling experience, and thus the Yin to their Yang in the Emprise’s Field that Ling tries so desperately to understand. This sort of mixed message is old hat where Tsui Hark is concerned. Arguably Hong Kong's most frustrating auteur, his films can assault the senses so completely that any semblance of an underlying message can be completely lost. As a deconstruction of the wuxia pian, it's arguable if The Blade really works. Unlike Clint Eastwood's The Unforgiven, The Blade doesn't reach a definitive point that subverts the genre's iconography. Instead, we get a mishmash of stories and themes, and the probable outcome of Tsui Hark having his cake and eating it, too.